It’s my local harbour and I suppose it’s a case of familiarity breeds contempt, but I do tend to view fishing Dunbar more as a bread and butter exercise rather than as premier angling. 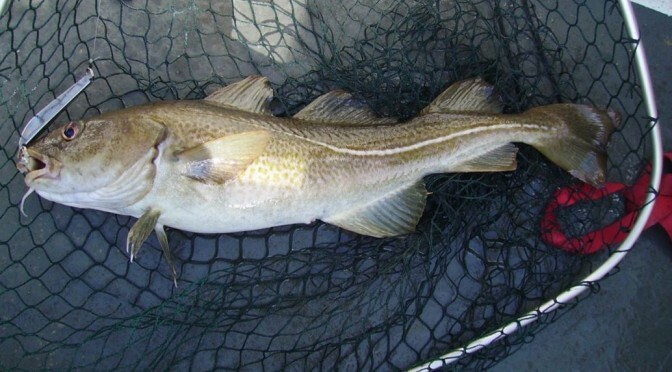 Given it can produce large numbers of decent codling together with some large ling and pollack this has to be a bit unfair, and an angler from outwith SE Scotland will probably enjoy quality fishing. Aside from the codling, pollack and ling, Dunbar can produce mackerel (in plague proportions sometimes), coalies, wrasse and a range of other species including flatties, pout, catfish and oddities such as Norway Haddock. Porbeagle shark inhabit the area at times as well, if you’re feeling ambitious. Fish are not large (I’ve had 3 double figure fish – all ling – in over 20 years fishing), but can be numerous. Most fishing is done on the drift using simple baited lure rigs (with or without a baited pirk), or jelly worms/shad type rigs fished in spinning fashion. Bait is mainly mackerel, but worm can be a killer at times, especially for species like wrasse. Most marks are close in along the shore (generally within 0.5 – 1 mile of the shore, between Bass Rock and St Abbs Head), although there are a few areas offshore that I fish occasionally with variable results. If pushed I would concentrate on the area between Barns Ness light and Torness, but there are plenty of other options. Wherever you go, expect to lose gear. You can view all my posts on Dunbar here. hi iam going to stay with family over the festive period in dunbar. i dont drive so would be looking to do a bit of fishing locally. have have you any ideas on location and baits i could try? Given you’re not driving I’d be inclined to try whichever of the Dunbar beaches is closest to you, early flood tide, and after dark. Do not overcast – 90% of the fish are 10-20 yards out. Mackerel baits will work OK, but I prefer a 2 hook rig with one mackerel, one lug bait. If you’ve rag bait (dug, not the farmed stuff) that can be very effective.